The surprise success of 1985's Teen Wolf made a sequel logical. The problem was that Michael J. Fox had another picture out that summer – a little movie called Back to the Future – that cemented his star status. He simply wasn't down to make another teen werewolf flick at that point. That deterred no one. Fox was replaced with Jason Bateman, and the result was Teen Wolf Too. The 1987 sequel is being released in a collector's edition Blu-ray by Scream Factory on August 8. Bateman plays Todd Howard, the cousin of the character Fox played in the original. Like his family member, Todd is part werewolf. This serves him well in college, where the pesky dean (John Astin) expects him to do for the university's boxing team what his cousin did for the high school basketball team. Todd initially doesn't want to be a wolf, but it does help him in the ring. It also brings the attention of the ladies, especially his dream girl Nicki (Estee Chandler). The plot of Teen Wolf Too is completely recycled from the original. Todd discovers his wolf side, tries to hide it, embraces it once the benefits become clear, turns into a narcissistic jerk, then manages to work everything out in time for the sports-related finale. Even many of the jokes are reminiscent of the first installment. It truly is one of those sequels that gives you the exact same thing. So why has the movie cultivated a dedicated fan base? For starters, Bateman is winning, as always. He wasn't the acclaimed actor/comedian then that he is now, but the talent is clearly there. Even if the plot is nothing new, Bateman injects some real energy into it. Scenes he shares with Astin (deliciously chewing the scenery as the mean-spirited dean) are particularly funny. Teen Wolf Too also has that “pure '80s” vibe. This is, after all, a movie that has three music montages in a row. (And yes, Oingo Boingo songs are on the soundtrack.) Such storytelling techniques were the norm back then, and many who grew up with them still maintain a soft spot for the approach. There's no doubt that this is the lesser of the two movies in the series. Still, anyone with fondness for Teen Wolf Too, imperfections and all, will surely be happy with this clean-looking Blu-ray release. 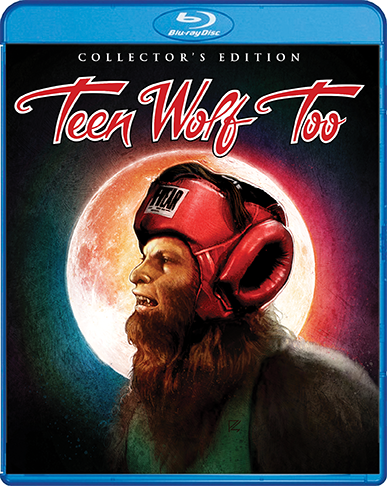 Scream Factory's collector's edition Blu-ray of Teen Wolf Too drops on August 8. While there's nothing as comprehensive as the 143-minute retrospective documentary on the Teen Wolf disc, what's here is still pretty impressive. “Working with the Wolf” interviews director Christopher Leitch and some crew members about the making of the sequel and the approach they took to it. “A Man of Great Stiles” focuses on actor Stuart Fratkin, who took over the role of best friend Stiles from Jerry Levine. He talks about trying to find his own approach to the character, rather than attempting to replicate what the originator did. “Nerdy Girl Saves the Day” brings us Estee Chandler, who heaps praise on Jason Bateman and reminisces about their scenes together. “Otherworldly” is all about actress Kim Darby, who plays an influential professor of Todd's. Among her topics is the manner in which she was hired. Bateman's father, who produced the movie, brought her on because he felt she had an appropriately “otherworldly” vibe. (Hence the title of this segment.) Finally, there's “A Wolf in '80s Clothing,” which centers on the costume design. A still gallery is also here. The bonus features add up to about fifty-five minutes, and they cover a nice range of topics. It's probably not surprising that Jason Bateman didn't take part, but everyone else makes sure to provide an enjoyable look back at this cult favorite. Teen Wolf Too is rated PG-13 for language and some innuendo. The running time is 1 hour and 35 minutes.